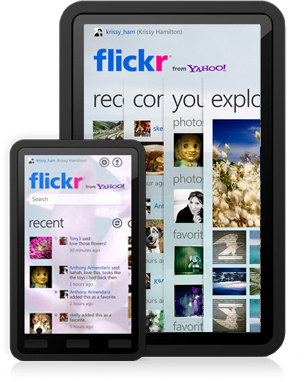 Even though it sort of popped up last month, Flickr is now officially available for Windows 7 and Windows Phone 7. What does this nifty app do? Swipe through panoramic blades to see all your recent activity, latest uploads from your contacts and all your newest uploads. Fully optimized for brilliant hi-resolution display. Tap on a photo to bring up a full-screen lightbox view and zoom in to enlarge and get close up on details in a photo. You’ll be able to access your photos in their original resolution, right from your mobile device! Geo-location capabilities display your photos on an interactive, full-screen map. Also view nearby geo-tagged photos from the Flickr community on the map as well for a slightly different view of the world around you. Easily share photos to your friends from your mobile device directly to Flickr and also from Facebook, Twitter or email! There’s a microsite showing off some of the action. Download the app from here, if you fancy it.